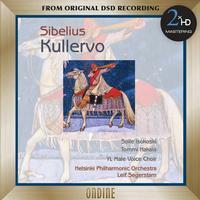 On this final release in their Sibelius cycle, The Helsinki Philharmonic Orchestra and longstanding chief conductor Leif Segerstam present Sibelius’s early choral symphony Kullervo, based on the legend of Kullervo in the epic Kalevala, the mythic history of the ancient Finns. The success of this work turned out to be the breakthrough of the great Finnish composer’s career who became a true national hero. The sung parts in the third and fifth movement are performed by native speakers; famous Finnish soprano Soile Isokoski, acclaimed baritone Tommi Hakala and the internationally reputed YL Male Voice Choir.